1. 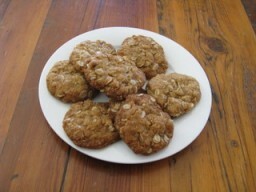 Combine oats, shifted flour, sugar and coconut. 2. Combine butter and syrup, stir over a gentle heat until melted. 3. Mix bicarb with water and add to butter mixture. Stir into dry ingredients. 4. Place tablespoons of mixture on lightly greased trays allowing room for spreading. Cook in a slow (140-150c) oven for about 20minutes. 5. Loosen while warm and allow to cool on the trays.